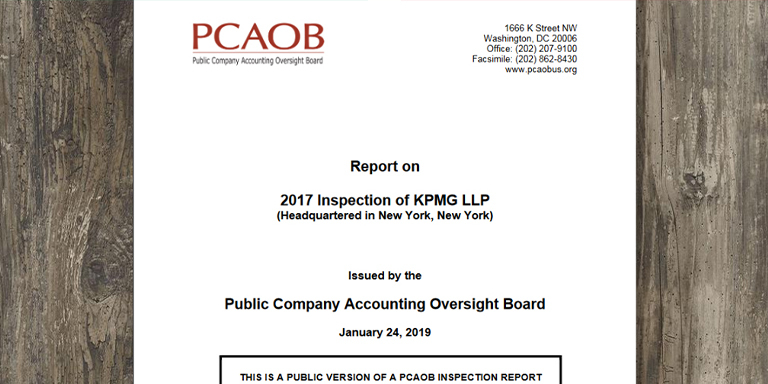 The Public Company Accounting Oversight Board has made public portions of its inspection report of KPMG LLP based on its determination that the firm failed to address certain criticisms contained in the PCAOB’s October 15, 2015 and November 9, 2016 inspection reports on the firm. Those portions can now be viewed within the public versions of the reports on the PCAOB’s website. In a statement from KPMG accompanying the PCAOB’s release, the firm points out: “Notably, during a significant portion of the applicable periods, remediation efforts were being led by individuals who engaged in conduct that undermined the integrity of the regulatory process through their inappropriate use of PCAOB confidential information.” That was when one of KPMG’s employees who had previously worked for the PCAOB had received leaked advance information on which engagements would be inspected by the PCAOB (see sbr 5/17).